Long, long ago, on the 20th floor of a Chicago high-rise on a Monday morning, an Iowa farm girl turned architect handed me a jar of homemade strawberry jam. I was a landscape architect in this firm of 300 people and I was amazed that she had canned a jar of strawberry jam. When I say canned, I mean, made the jam and preserved it in such a way that it would remain fresh in a sealed jar without refrigeration for one year. Let’s face it. 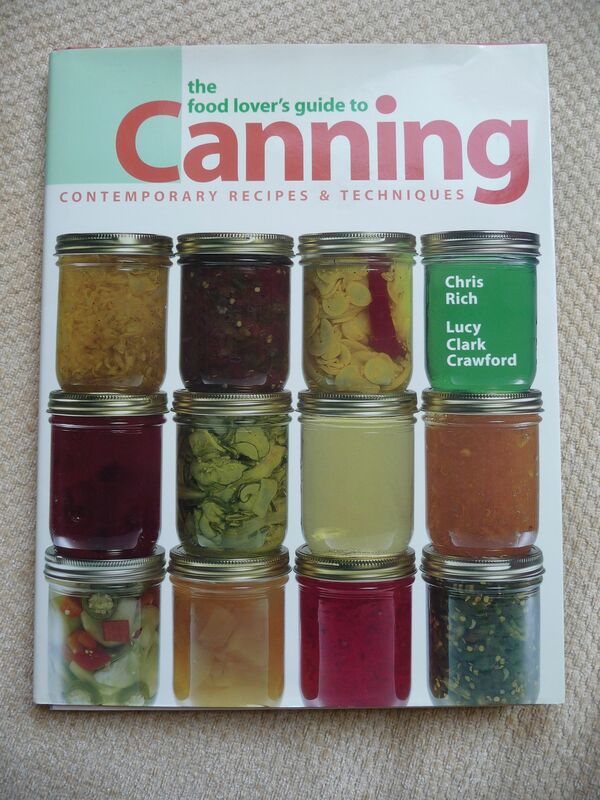 I grew up in the TV dinner, Tang and lime-Jello salad era and even though I’ve always been a from-scratch cook, canning seemed to me something that required a certain inherited knowledge, which I had not received. Like quilting, no one in my family canned during my childhood. I’d see stacks of canning jars at old hardware or country stores next to paraffin wax blocks and pectin and it seemed akin to alchemy to me. But this young woman told me that she had made it in her bread machine! She explained her method to me, mercifully with no paraffin needed. “You just make two jars at a time. It takes an hour. No big deal,” she explained. I had always assumed that you needed to make massive batches that were impractical for our then family of two. 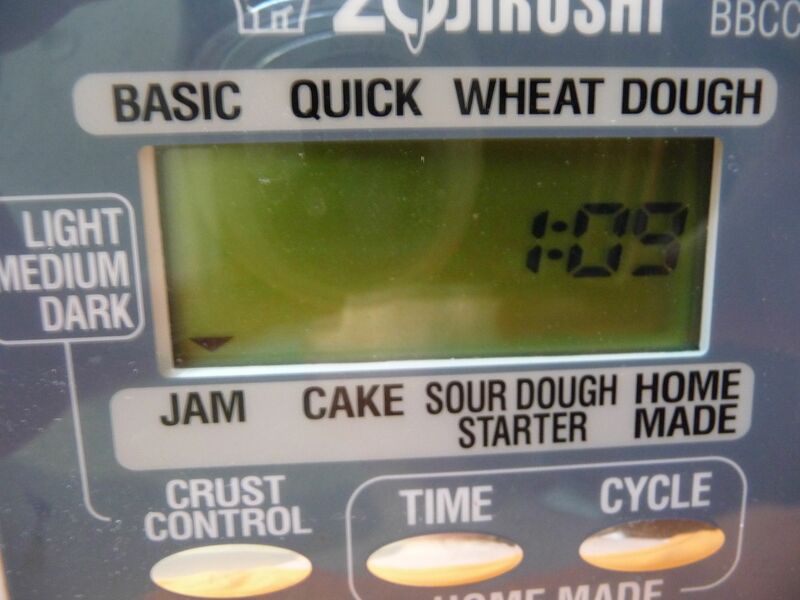 I had a Zojirushi bread maker with a jam setting to I bought some jars and began to research. I quickly learned that pectin is a naturally occurring thickener that is useful in jams. I also figured out that having the right acid level and “head space” which is the distance from the top of the jam to the jar’s lid is critical. These factors make this no-water-bath method successful. You may not use this method to can green beans for example. This method only works for high-acid foods and please be careful to follow each step carefully. 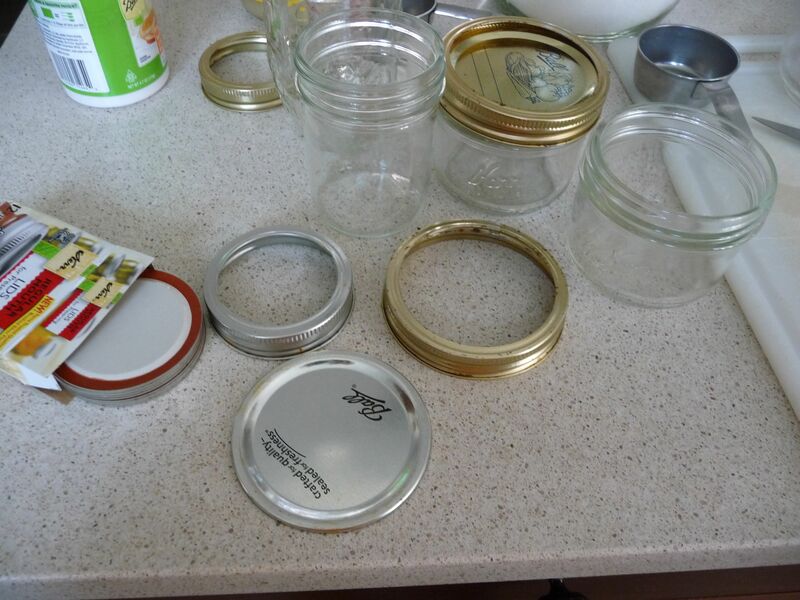 The most important step is to confirm that the jars are properly sealed. Otherwise, make the jam and freeze it or store it in the refrigerator for two weeks. For more information on learning to can, I recommend this book and the Ball site http://www.homecanning.com/. 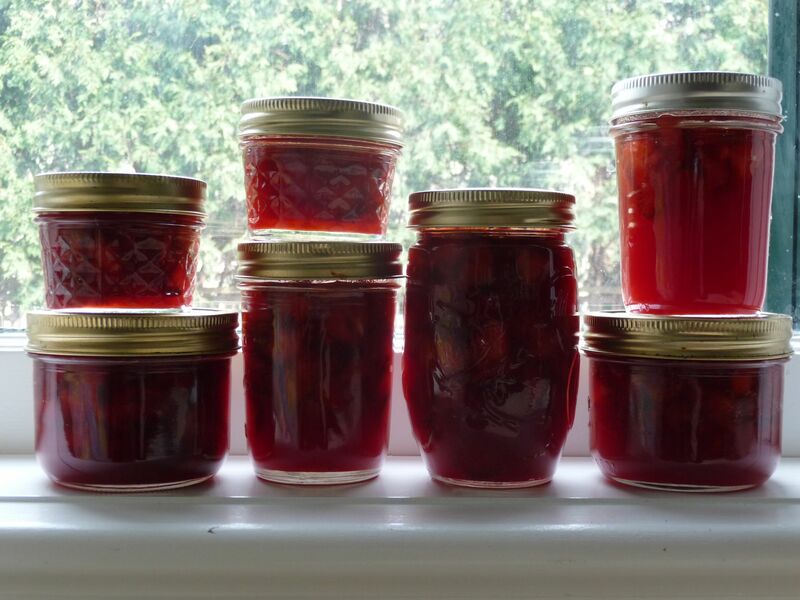 I will warn you that strawberry jam was the gateway drug for me and I have since progressed to salsas, canned peaches, pasta sauces, chutneys, applesauce, pickles and pickled onions. Some of these require the full water-bath method of canning, which is no big deal if you just set aside a day to can a ton of fresh stuff. By mid-September I am thrilled if I have a pantry full of Christmas gifts and jars full of summer freshness to open in January. I admit that being married to a man named Kerr makes it fun to give friends jam in a Kerr jar. I can hardly wait for blueberry and tomato season. So if there’s ever a national disaster involving large amounts of toast, we’re set. 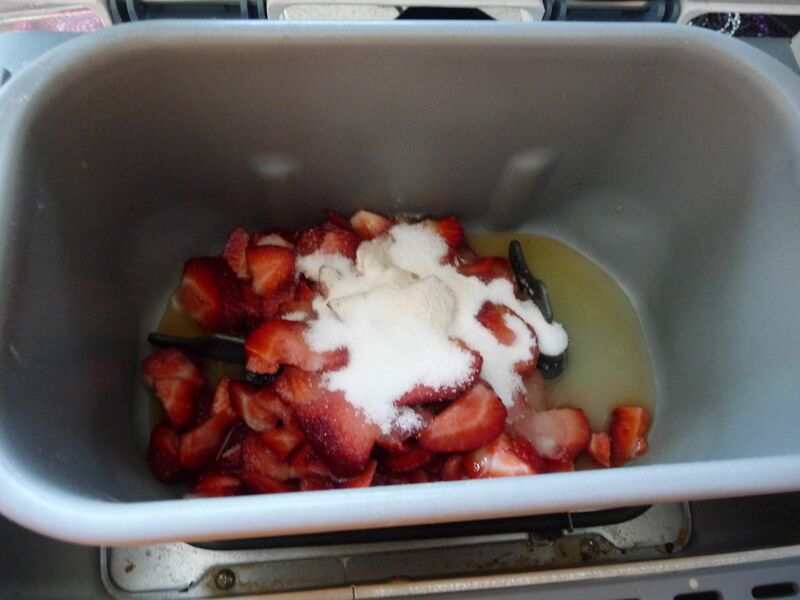 To make 3 8oz jars of basic low-sugar strawberry jam, measure 4 cups of chopped or mashed strawberries. 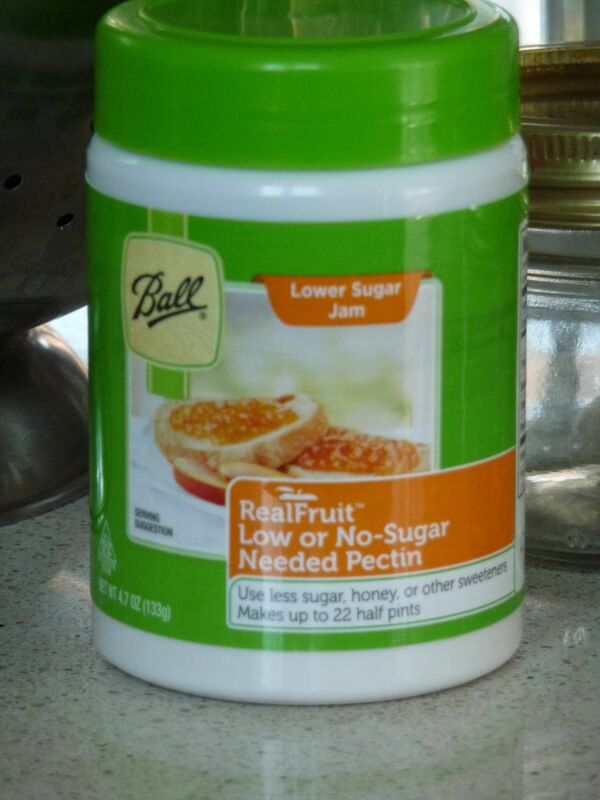 Measure 3 T of low-sugar pectin, 1/3 c each of lemon juice and water and 1/2c sugar. Dump everything in the bread machine and set on the jam setting. The jam cycle on my machine is 1 hour 20 minutes but the last 20 mins is for cooling. You don’t want to let the jam cool for this method so the second you hear the cooling cycle start, unplug the machine and get moving! If you don’t have a bread machine, you can simmer and stir the jam until it becomes a thick syrup. 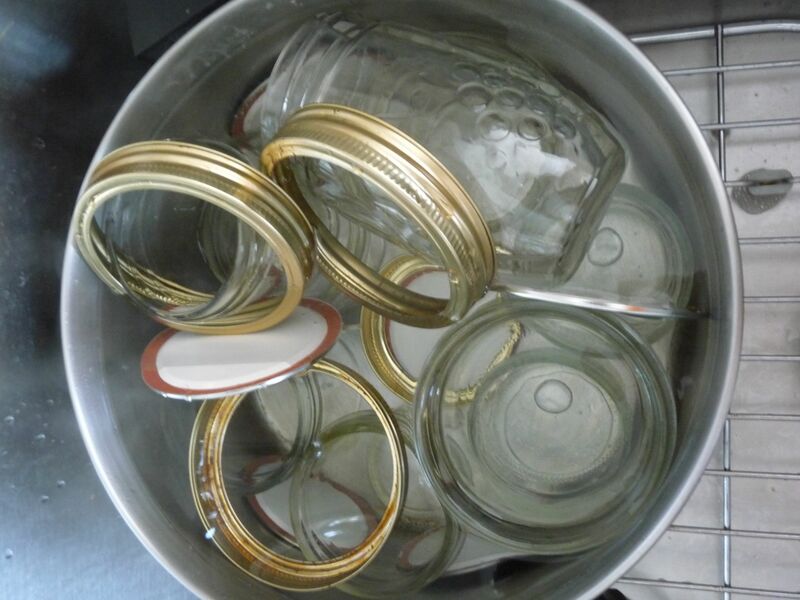 While the jam is cooking, sterilize the jars by pouring boiling water over them in a deep pan. Use a pair of tongs to place them on the counter while you wait. Do not touch the inside of the jar with your fingers. 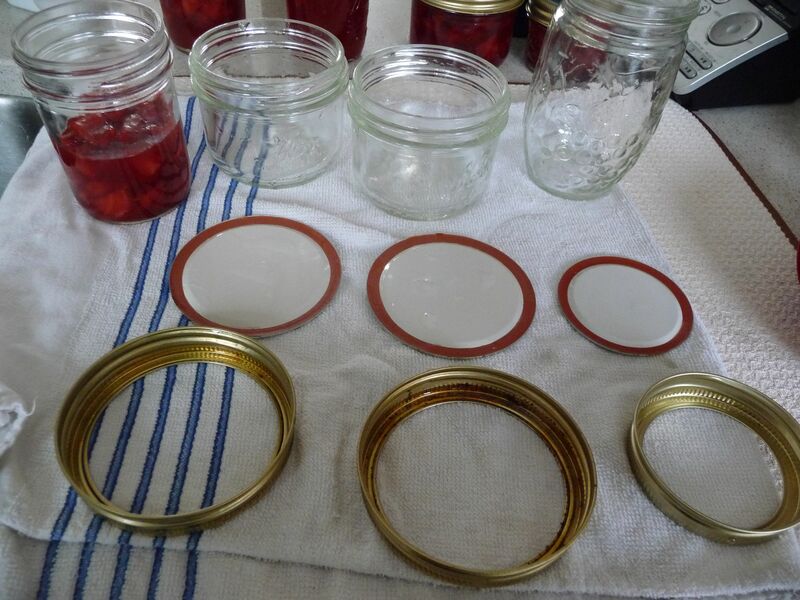 Organize the lids for quick assembly once the jam is ready. Not wanting to waste a drop, I set aside a jar for leftover bits from each batch and I either refrigerate it because it’s not a full jar. Once the jam is ready, quickly pour the jam into the first jar, filling it to the first ridge, which is 1/2″ from the top of the jar. This is the ideal headspace for jam. Put the lid on the jar and then screw the ring on to tighten it. 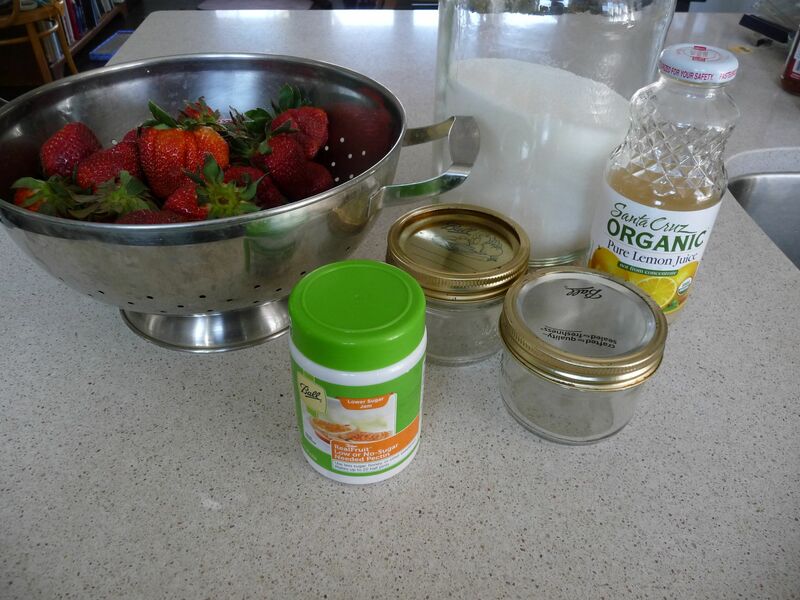 Invert the jar so any possible bacteria in the air with be killed by the eat of the sugar. Once cool, turn the jar right side up and test the seal. If you push the top in the center, it should not move or make noise. If it pops back up, the seal is not tight and the jam must be refrigerated. Be sure to write the date on each lid. The jam will keep in a cool, dark place for a year but the brightness of the color will darken after a few months. Do not eat any jam that has mold or any other growth. This indicates that the seal was broken and the food has spoiled. Refrigerate after the jar has been opened. 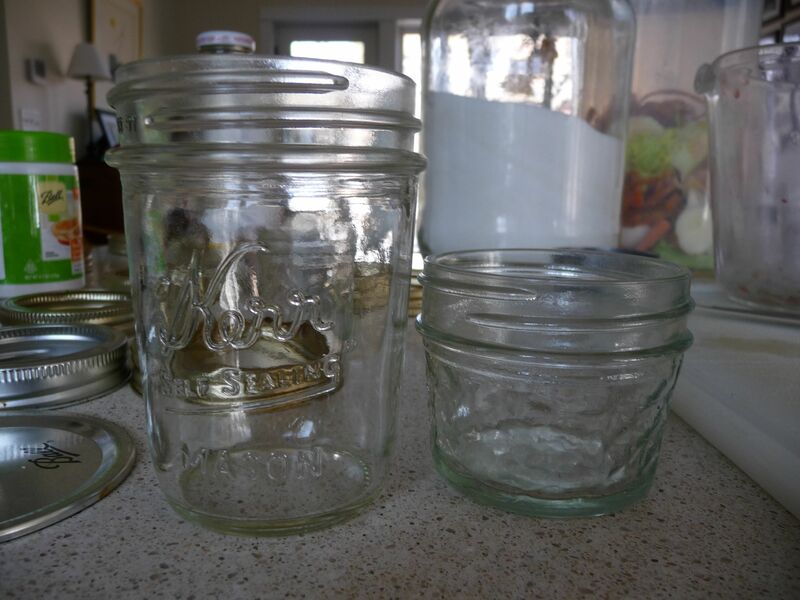 Canning jars come in a variety of sizes and shapes. The are either regular or wide-mouth and come in 4 oz, 8 oz, 1 pint, and 1 quart sizes. You can buy replacement rings and lids for both sizes and easily find Ball or Kerr jars on Craigslist if you don’t want to buy them new. Unless you have an enormous family, 4 and 8 oz jars are best for jams and the jam may spoil before you use a pint of it. I always like to have a few 4 oz jars around to be able to give to our daughter’s teachers or include with a fresh loaf of bread as a hostess gift. Ball has reintroduced it’s Vintage style blue-glass canning jars for 2013. While pretty for cotton balls, you will not be able to see the beauty of your food if you use them for canning. Goodness you are so busy Weeks! Thanks for this tutorial, I will think about trying a little jam, it sounds good! I grew up with a mother who canned EVERYTHING, so I learned all of this at a very young age. I really thought that all people did the same thing (spent their summers slaving over a garden and canning everything)–was very surprised to learn that that wasn’t the case, that some people actually bought fruits, vegetables, and jams at the grocery store! This is great info. Thanks! Would you possibly have a recipe for blueberry jam in a bread machine? Thanks in advance. ← Craftsy sale this weekend only!